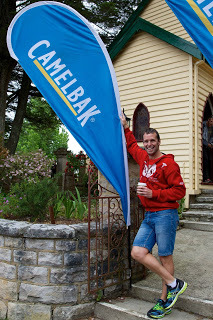 Geoff’s Story: Bundy Run 2015 – Winning me Over! Every runner writes their own story. At New Strides Running, we encourage each other to embark on their own journey to discover what running means to them. 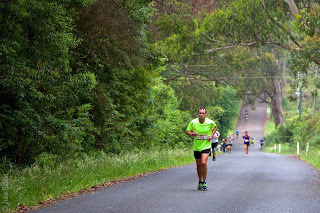 Here, New Strides Runner, Geoff, writes about his experience in the inaugural Bundy Run, a trail festival located in the Southern Highlands village of Bundanoon. This was Geoff’s first real experience at a fully-fledged trail type event, and here he shares his delightful discoveries with you so that you may join him on his adventure into the unknown. Arriving in Bundanoon with Julie and Bruce on a misty and damp Saturday afternoon we were greeted with a hive of activity. Mountain bikes and people were everywhere. There were vendors in their pop-up vans, stalls showcasing the latest gear and the Wild Horizons announcer chatting over his portable microphone giving the day a festive feel. The day had started off with an uneventful drive up the mountain. Our driver, Bruce, excelled himself with a parking spot less than 50m from the start line and directly in front of the coffee shop giving us a brilliant central base for our assault. Before doing anything else we checked in for the Quarter Marathon, one of three race distances on offer, and went to pick up our free Pearl iZUMi socks and Gu gels. Wandering through the stalls Julie was able to get some last minute shopping for her upcoming travels while Bruce and I perused the other vendors. All too soon it was time to prepare for the run, so we returned to our base to change. After a light warm up and stretch we returned to the event hub at the school ready for action! The pre-race briefing was concise and informative, and as we gathered at the start line it seemed that there were not many runners wanting to be at the front so I moved forward into the lead group next to my good friend, Rob, who was competing in the Half. Surprisingly, the more festive feel to the event meant that I was not as nervous as I had been in other events. The countdown wound down to zero and we were off! Starting at the school meant a short run down the driveway then onto Constitution hill for a steep downhill trip. The “over 40’s” took this first section very easy to avoid early protests from cold knees and quads before a sharp left at the bottom of the hill took us into a nice flat road. This quickly became a single trail and here the snake of runners wound through in close proximity with one eye firmly on the runner in front and the other fixed on the ground to avoid any early incidents. Twisting and turning through trees at a solid pace I navigated this section issue free and we emerged at the road and our first real climb. Here my training on hilly courses allowed me to move through the pack somewhat and stay in touch with the leaders as I maintained cadence albeit with a shorter stride. This suburban section was the highest point of the run, and although the surface was even and easy it wasn’t what I was here for! Happily, it didn’t last too long and we were soon greeted by the Glow Worm Steps. These proved a tricky descent as the steps were different widths and heights meaning I had to goose step, double shuffle and occasionally stride longer than I would normally do to descend as fluidly as possible without compromising speed. At the bottom of these steps, and a short descent, the Glow Worm trail wound ahead of me. By now I had caught my good friend Rob and the two of us (with a hardy group of equal ability runners) navigated this superb undulating section of single trail. It was so beautiful and peaceful that you could easily forget that you were competing. It was also a pleasure running with seasoned trail runners who called out helpful tips like “log” and “loose rock” and “low branch” as they encountered them. Nobody wants to be victorious at the expense of the health of another runner! Unfortunately this section was over far too quickly for my liking and we were back onto fire trail. I was wondering at which point I should leave Rob behind as he still had to go around again, but the eventual women’s Masters winner made that decision for me as she moved out from behind me and passed us both. I tucked in behind her, and with some encouraging words from Rob, we moved off along Riverview Road at a more brisk pace. 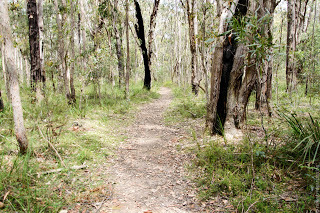 It was nice to get into an easy stride, and we passed a group of Acapella singers set up in a tent (it was too early for hallucinations so they must have been real) just before dropping down into the Bundanoon gullies. This descent was tricky and very taxing mentally as I negotiated steps, both metal, and hewn from the cliff face. 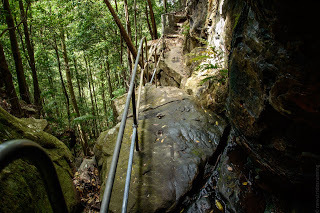 I was holding on to handrails at some points and skipping over moist mossy rocks and over puddles. This became more an exercise in survival than an attempt at speed. Most of our fellow competitors were happy to stay in our running order. In fact, I was passed only once in this entire section. The cloud cover unfortunately masked any views as I passed through the amphitheatre, which was possibly a godsend as I doubt that I would have been able to enjoy it anyway. My fellow competitor and I were able to reach the bottom without any incident, and surprisingly I felt renewed by the slower pace despite the distance I had already travelled. We had opened up a decent gap to the next runner behind me and were travelling well. Julie and I had been pre-warned by coach Mel about the technical side of the course, and as I followed my new found running buddy through Nicholson Pass I realised it was indeed by far the most technical running I have ever done. Both mentally and physically challenging, it was nearly impossible to get into any form of rhythm or stride. Conversation was still possible, due to the reduced speed, and was welcomed as it also meant this section felt longer than it normally would have. Winding along tight and sometimes exposed sections of single pathway that a mountain goat would not find unusual I was grateful for Melanie and her scouting expedition. Despite the difficulty, I was having the time of my life. It was the most fun I have had in a race. Ever. Finally, all good things must come to an end and I was greeted by a stone stairway leading up and out of the pass. Feeling enthused by the fact I was over half way through I passed both my companion and another runner and skipped up the stairs with the knowledge that I was in much better shape than those I had just passed. I reached the top of the stairs feeling tired but knowing that the climb was over and began the next part of this run with a spring in my step. This didn’t last as long as I would have hoped. I had forgotten that the climb was only half way done! The next section was a steady climb punctuated by winding sections that needed to be walked. It seemed to go on forever! My legs and lungs were starting to protest as every corner revealed the same view and the tree line was forever upwards. Just as I was about to concede defeat the water station at the 7km mark came into view. My companion through the tricky section had rejoined me and to my lament she was running strong and true. I wasn’t thirsty, however I was tempted to stop for a quick drink but when another competitor behind us shouted “is this the water stop” we silently agreed that this would be a good opportunity to put a gap between us and him so we kicked off along the fire trail with renewed vigour. I ran next to my friend for a good while, until one of the gun Half Marathon runners passed us, and my companion tucked in behind him and left me behind. The fire trail ran downhill for a time allowing me to recharge somewhat, but I was still feeling the pain as I passed the Sunrise Lookout and turned back inland for home. The last few kilometres were an exercise in mental toughness. I knew I could keep going, but the doubt and fatigue were starting to make me think those thoughts that every runner dreads “I could just walk a little bit, there’s no shame in that”. But, of course, you know that once you do stop that you may not start again. So I steeled my resolve and, like a land-bound Dory, hummed the ditty “just keep running, just keep running” and tried to concentrate on the positive thoughts and knowledge that I was on the homeward stretch. This section still remains a bit of a blur, I can remember only parts where I had glanced around and had seen another runner about 400m behind me and realised that slowing was not an option if I wanted to keep my position. Finally the park exit came into view and I could see along a straight section that I was not too far behind those who had passed me earlier. I saw the hill in the distance and strode out past some officials with encouraging words for me and started the final stretch home. I reached the hill and drove up it as best as I could, happy when I reached the crest until I looked ahead to see another steeper one, the aptly named Constitution Hill. I thought I had just run up it! I used the short downhill section to get up a bit of momentum and then began the climb to the finish. I had made it about 1/3 of the way up when my legs and mind gave up and I began to walk. As I reached an official after about 10-15 steps he helpfully informed me, “They’re catching you, you know.” I groaned inwardly and started jogging again up to the welcome sight of Bruce and his camera. Bruce let me know that I was only about 300m from the finish. Finally cresting the hill and using the last of my reserves I strode out solidly to the finish line in a time of 1:07. I wandered around for 10-15 minutes enjoying my pre-race banana a few extra times and, once recovered, wandered down with just enough time to see Julie finish her run and cheer her on for the final bit. After we had recovered and had a drink we moved into the Soldiers Hall for our complimentary dinner. I chose the huge portion of lasagne and salad, followed by sticky date pudding. During dinner we chatted with several people from both the run and those entered in the Highland Fling mountain bike race the next day. The friendly feel to this whole event has certainly won me over! 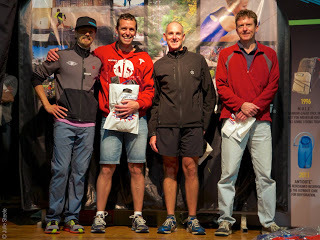 We decided to hang around for the presentation and much to my delight I managed 8th finisher, 5th male and 2nd in the Masters, winning a Camelback for my troubles. Julie had managed 45th finisher, 9th female and 3rd in the Super Masters, making it a successful trip for us both! I have penned this event firmly in my calendar for next year, with the aim of doing even better. Special thanks, as always, to Melanie Foster my dedicated friend and coach, not only for preparing me mentally and physically for this run, but also for scoping out the course the week before and giving us cheat notes on what to expect and how to attack each section. Also, thanks to Bruce Steele for driving me up and back, I doubt I could have made the trip solo! The Wild Horizons Bundy Run festival is one part of the popular cycling event known as the Highland Fling. Distances on offer include the Half Marathon, Quarter Marathon and the 6km “Teaser”. Further information can be found HERE. All images in this write-up ©Bruce & Julie Steele or ©New Strides Running. Feature image courtesy of Pearl iZUMi Australia.